How to Resize casper-rw images: TopoResize is a Free Image Resizing Tool create by Chris Semler that can be used to resize images containing an ext2 or ext3 file system within Windows. This nifty tool can be used to create a new image and shrink or enlarge an existing image. Cygwin is used to port Linux file system tools like efs2progs to Windows. TopoResize can be used to resize casper-rw loop files and even resize Pendrivelinux 2009 filesystem images. 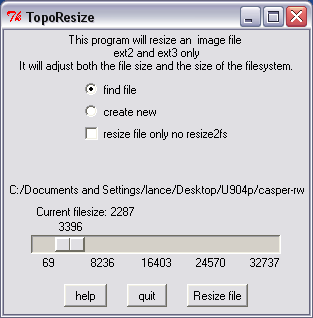 TopoResize was witten by Chris Semler and was mainly used to resize coLinux ext2 and ext3 file system images. Note: The maximum possible size for a file on a FAT32 volume is 4 GB minus 1 byte. So keep in mind that TopoResize cannot exceed this limitation if your storing the resulting image on a Fat32 volume. That's all there is to it. If all goes well, you should now have a resized casper-rw partition. TopoResize is portable, so it can be stored and run from a USB device. Alternately, you can use Casper-RW Creator to create a casper-rw persistent file in Windows.